Perched on the central western coast of the Istrian Peninsula, Rovinj was once an island. The channel separating it from the main peninsula was filled in during the mid 1700s connecting it to the mainland. Twenty-two tiny islands continue to welcome visitors to this very Venetian town, sporting a distinctly Italian vibe. 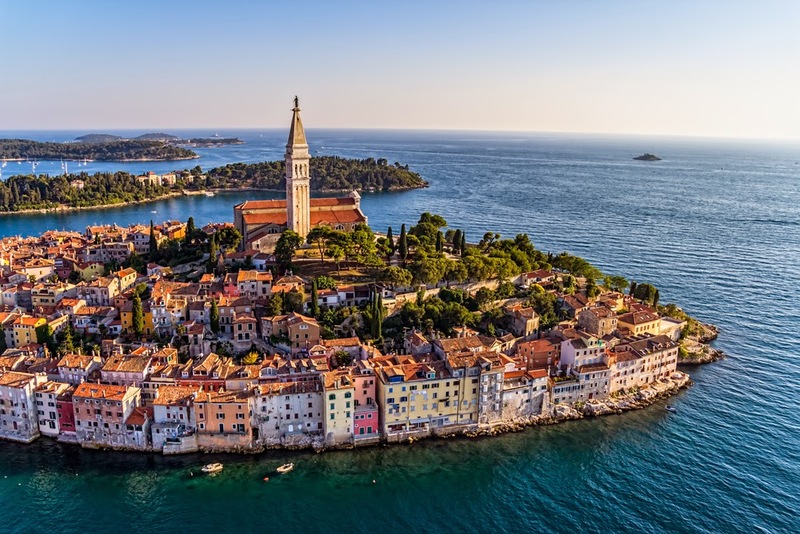 From its early Illyrian heritage, Rovinj endured rule by the Romans, the Byzantines, the Franks, then the Venetians, who ultimately built walls and gates for protection against intruders. The 18th century fall of Venice opened the door for Napoleon, followed by Austria and Yugoslavia. Upon the conclusion of WW1, an exodus left Rovinj a changed city, ultimately leading to independence. This simply lovely fishing village and tourist town also provides education, research, and medical treatment in the Center for Marine Science, Center for Historical Research, and the Martin Horvat Orthopedic and Rehabilitation Hospital. This beautiful, compact town makes for a wonderful walk among its sites. The St. Euphemia Church in the town center, with its bell tower, is a must see, along with the fabulous market, the square at the bridge, The Batana Boat Museum, and the Balbi Arch, complete with winged lion, a Venetian artifact. From the hill forts echoing the Bronze Age, to the wine bars, concerts, modern hotels, and busy markets today, Rovinj remains a relaxed, inviting, romantic destination for visitors and residents alike. Rovinj is a Croatian fishing port on the west coast of the Istrian peninsula with a population of about 15,000. See Best of Istria Google Map for additional recommendations of places to see and things to do in Rovinj.